J W Young's Ambidex fixed spool reel, gold finish, 1/2 bail arm, lovely side plated with full patent details, runs well, complete with paper catalogue. 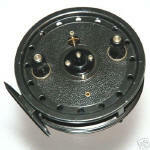 A new boxed J W Young's Bob James Lightweight centre pin reel. These reels are of renowned quality and the Bob James lightweight allows you to fish tirelessly all day due to its cut away cage. Machined to the highest of tolerances the reel still retains strength. They are superb for barbel, chub, grayling and even Salmon. Used once, the Ray Walton Rolling Pin, like new with serial number 107, all packaging and paper work. 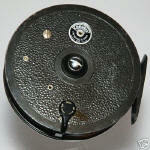 J W Young's Ray Walton "Rolling Pin" centre pin reel. The Ray Walton "Rolling Pin" features a unique side casting action, 2 ball bearings, click check and comes with a certificate of authenticity The "Rolling Pin" is a unique 'side casting' reel designed for Barbel fishing in particular. The drum can be swivelled so that you cast off the side of the drum. This makes fishing in tight spots or where long distances are necessary a simple task. Once cast, you then return the drum to its customary 'centre pin' format. Weighs 265 grams, size 3 and 3/4 inch diameter and 1 inch wide. J W Young's Trudex centerpin and Young's leather case. A 4 inch centerpin reel the Trudex made by J W Young's and Sons, Redditch, England. Very light paint loss mainly to edges. Built to last and will give a lifetimes pleasure. Complete with lever operated check, micro adjustable drag, quick release drum and removable line guard. Also comes with padded reel case made by J W Young's and stamped with the company logo and real pigskin. A vintage J W Young's 4 inch Trudex centerpin reel from February 1962 in the manufacturers box with guarantee paper work.